One experience you absolutely must not miss while in The Netherlands is a canal boat tour in Amsterdam. 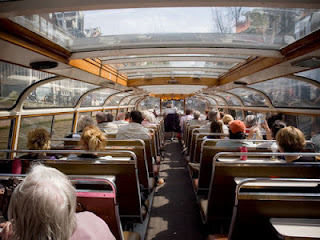 What the red double-decker buses are to London, are the long, flat canal boats to Amsterdam. Once only accessible as entertainment for royalty and visiting VIPs, today the canal boat tour is the number one tourist attraction in the country, welcoming more than three million visitors per year. If you've never done any kind of tour even similar, you will be amazed by how the boats' able captains skillfully navigate around sharp corners, narrow tunnels, and even manage to miss the many small canoes, boats, and houseboats along the way. 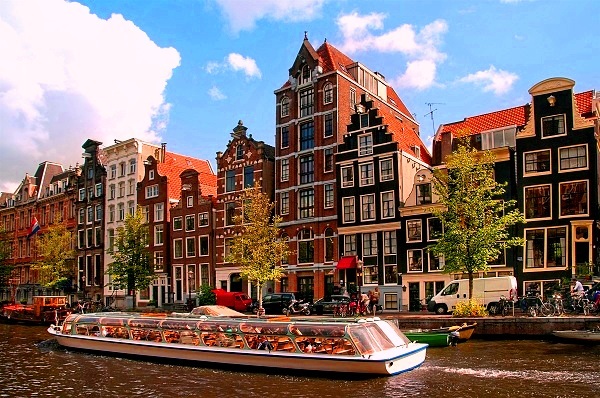 It really is the only way to see the tall, skinny canal houses of Holland's most famous city. 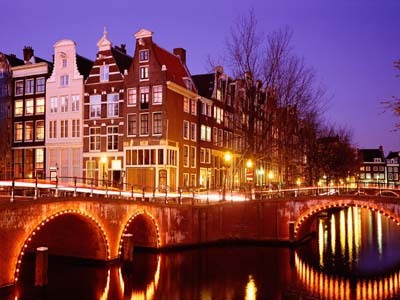 Most of the tours last anywhere from 2 - 3 hours and you'll see most of the famous Amsterdam canal houses from the water side including the Anne Frank house. Or, opt for the hop-on-hop-off Canal Bus which stops near some of Amsterdam's most popular museums and attractions. Private canal cruises through the Amsterdam canals. Search and find the perfect boat matching your specific needs. Boat company with 6 vessels and agent for another 30 boats in Amsterdam. Discover the city and the idyllic canals at your own pace, completely undisturbed by the traffic. The Hop on, Hop off cruise is an ideal way of getting around the canals. Take a cruise along the illuminated canals while indulging in a delicious four-course dinner. A one-hour cruise takes you through the UNESCO World Heritage canals with all their highlights. With several very beautiful classic canal boats. Offering a large variety of appetizer, lunch, dinner and other entertainment packages. Their brand new electrically powered saloon boat 'Soeverein' is the only one in the fleet with a piano on board. Amsterdam´s most beautiful saloon boat is available 7 days per week for private tours with gourmet food and wines. Rental of beautiful intimate saloonboats 'Paradis' and 'Ivresse' for 2 to 12 passengers and the elegant 'Belle Epoque' for up to 28 passengers. Also for lunches and dinners. The cosiest canal-cruises in Amsterdam. Jasmijn organises birthday parties, bingo cruises singalong cruises and a lot more. This company specializes in the rental of open boats, ranging from small self operating boats to the largest open boat in Amsterdam with a kitchen and toilet on board. Captain Jan's famous “Champagne and Roses Cruise”' and “Pre Champagne Dinner Cruise" and are legendary and have been the scene of many a marriage proposal. Exclusive cruises with a classic saloonboat, from pubcruise to a deluxe dinner. The beautiful antique saloonboat "Old Queen" is the flagship of this company. With two boats, designed for optimal enjoyment of what Amsterdam has to offer. Exclusive trips, delicious catering, fun packages in classic canal boats. Both small and large groups. From simple to luxurious dinners and drinks. Silent and environmentally clean luxury cruise on first commercial sight-seeing boat in Amsterdam. From drinks to extravagant dinner cruise. Apart from the standard one hour cruises, Blueboat hosts an impressive range of waterborne entertainment, like Percussion Cruises and Comedy Theatre. Totally agree! I actually find the boat ride in Amsterdam more enjoyable than the canals in Venice. Tonja - I still have never been to the Zuiderzee Museum but would love to go. Thanks for sharing your tip!